The Prime Minister levelled several charges against the Congress, including defrauding farmers and rewarding anti-Sikh riots accused, at the first of his 100-rally campaign for the upcoming Lok Sabha elections. 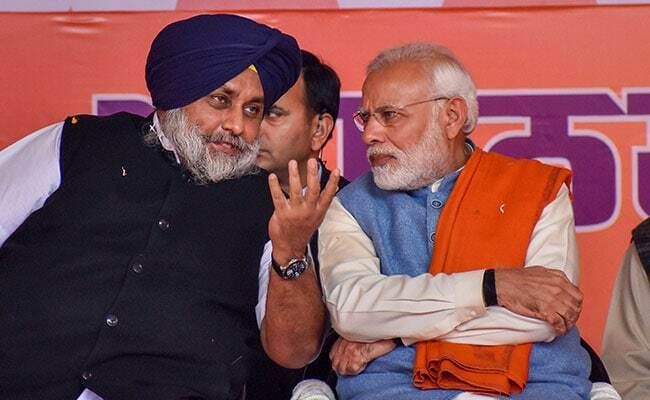 Narendra Modi with former Punjab Minister Sukhbir Singh Badal at the Gurdaspur rally. Prime Minister Narendra Modi today launched his 100-rally campaign for the upcoming Lok Sabha polls with a multi-pronged attack on the Congress, accusing the opposition party of defrauding farmers, compromising national security and shielding those responsible for the anti-Sikh riots in Delhi. "Although a certain family had given a clean chit to certain people involved in the riots -- even burying their files after calling them 'sajjan' (gentlemen) -- my government dug them out for a through probe by a special investigation team. The results are there for everybody to see," he said at the rally in Punjab's Gurdaspur. He was punning on the name of Sajjan Kumar, a Congress leader who was recently sentenced to life imprisonment for his involvement in the violence that followed the assassination of former Prime Minister Indira Gandhi in 1984. PM Modi also criticised the Congress for appointing Kamal Nath, a former accused in the anti-Sikh riots, as the Madhya Pradesh chief minister. "These people not only shielded those involved in killing hundreds of innocent Sikhs in Delhi but also rewarded one of them with chief ministership," he said. Although Mr Nath was allegedly seen directing a mob at the time, he was let off by the courts for lack of evidence. Congress leader Shashi Tharoor recently said he should be given the same "benefit of doubt" accorded to PM Modi in connection with his handling of the 2002 Gujarat riots. The Prime Minister then proceeded to slam the farm loan waivers announced by the Congress in various states under its rule. "For years, the Congress cheated the country in the name of 'garibi hatao'. Now it is cheating farmers in the name of loan waivers," PM Modi said. "They are only interested in politics of lies and cheating. It is misleading farmers in the name of loan waivers." The BJP-led NDA will face a resurgent Congress in the Lok Sabha elections next year, after upset defeats in Madhya Pradesh, Chhattisgarh and Rajasthan. It had lost Punjab to the Amarinder Singh-led party by nearly 60 seats last year. PM Modi cited several examples to drive home his allegation of the Congress being anti-farmer. "They promised to waive loans if voted to power in Punjab, but the truth turned out to be something else. As per their own records, only loans worth Rs 3,400 crore were waived in one-and-a-half years. Is loan waiver a five-year plan for the Congress? Will they give the loan waiver after the farmer's dead?" He said that the BJP, on the other hand, was working hard to bring all-round development in rural India. "We will double farmers' income by 2022. We want to empower them into becoming self-reliant," he said. The Prime Minister also accused the Congress of compromising national security by raising "baseless charges" of corruption and irregularities in the Rafale fighter jet deal. "The Congress is playing with national security. They are spreading lies for the benefit of one family," he alleged. The Congress is demanding a joint parliamentary committee probe into the multi-crore Rafale deal with French firm Dassault Aviation, alleging corruption and crony capitalism.